Chenin Blanc is South Africa’s most widely planted grape, and it makes some of the country’s most distinguished wines, including the ones reviewed below. Many of the best ones come from old vines, some very old. 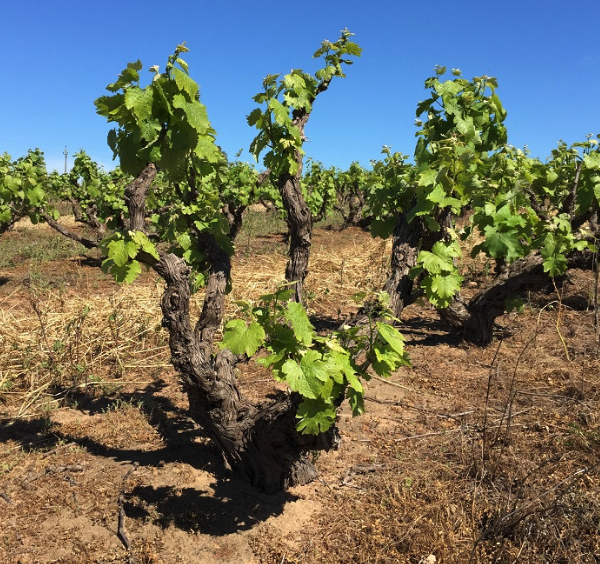 Rosa Kruger, whom we interviewed in Adi Badenhorst’s vineyard for the International Wine Review YouTubechannel a couple of years ago, is the force behind the Old Vine Project that aims to preserve these old, dry farmed bush vines. Farmers can afford to maintain these very low yielding vineyards only if they receive prices commensurate with the quality of the fruit. Our reviews of South Africa’s top Chenin Blancs, most from old vines, shows these wines are the equal in quality to the best white wines made anywhere in the world and should be valued accordingly. Hopefully, consumers and commercial wineries will realize this before it’s too late. Most premium quality Chenin Blanc is grown in Stellenbosch and Swartland, but it’s also grown as far north as Lutzville on Olifants River and as far east as Malgas, located to the east of Cape Agulhas. This area covers many different climates, ranging from the cool coastal areas of Walker Bay and high altitudes of Cederberg (1000+ m) and Piekenierskloof (as high as 750 m) to much lower (e.g., Walker Bay/Bot River) and wamer (e.g., Paarl) areas. Soils also vary widely, from sandy soils to decomposed granite, slate, and other soils. For more on South Africa Chenin Blanc, its history, where its grown, and how its grown, see our special report on South African Chenin Blanc and the many articles on South African wine we’ve published on our blog, including the recently published one on the Chenin Blancs of Breedekloof. Most of the wines reviewed here are from the 2017 and 2018 vintages. These are the last two years of the Western Cape’s extended drought. The drought and heat reduced yields, thickened skins, and brought about early harvests. Amazingly enough, and thanks to creative winemaking, the quality of Chenin Blanc produced remained very high during the drought. In some cases acidity was reduced, but growers picked earlier and changed winemaking to retain freshness and elegance in the wines. We find four principal styles of South African Chenin Blanc table wines. The first is fresh and fruity, often with citrus aromas and flavors and bright acidity and always unwooded; these wines are inexpensive, usually $10-$15 in the US market. Ken Forrester’s Petit Chenin Blanc, which is in this style, is widely available. The second style exhibits rich aromas and flavors, often of stone fruit, and a suave texture derived from battonage and time in neutral oak barriques; these wines are a little more expensive in general, usually in the $15-$20 range. The Mulderbosch Chenin Blanc is a good example of the style and is well distributed in the US. The third style is generously oaked wines that are usually rich in ripe, sometimes honeyed fruit, often accompanied by minerals, herbs and even saline components; the DeMorgenzon Reserve Chenin Blanc is a good example. These wines are usually $25 and above in price. The fourth style: The most special Chenin Blancs, we find, are the old vine, single vineyard wines, which are usually judiciously oaked and elegant. Because they’re made from very low yielding vineyards, these wines can be $35 and above in price. Good examples of this style include the Raats Eden High Density Chenin Blanc, the Sadie Family Skerpioen, the Keermont Riverside Chenin Blanc, and the Thistle & Weed Brandnetel. 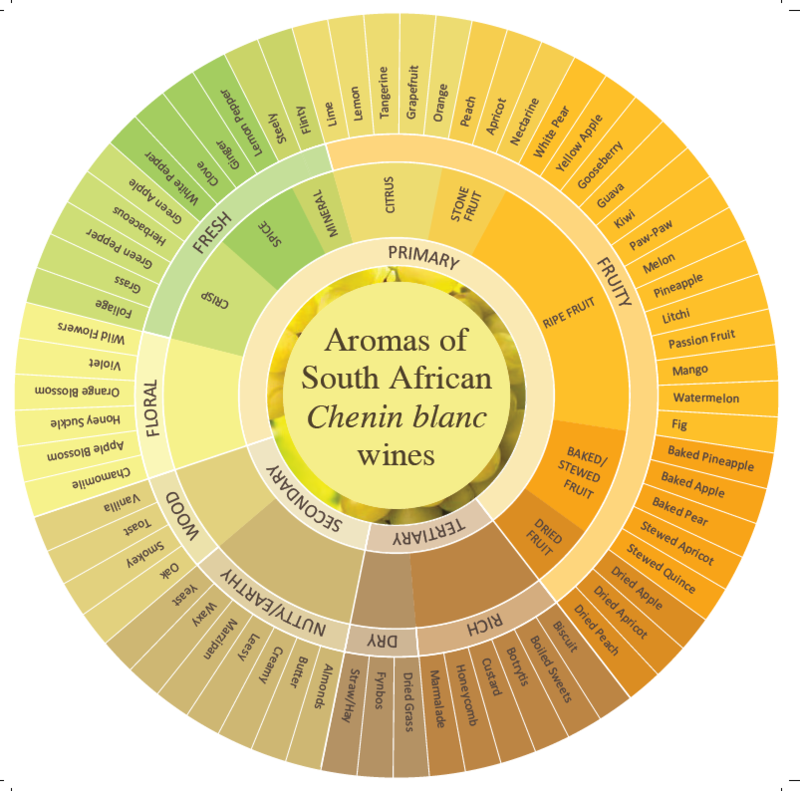 Stellenbosch University has come up with a Chenin Blanc aroma wheel (see below) that helps describe the diversity of Chenin styles. This diversity poses a marketing challenge as consumers may not know what to expect from a bottle of Chenin Blanc. The reviews below from wines tasted in early 2019 cover just a portion of the great Chenin producers of South Africa. Thanks to Ana Ines and the Chenin Blanc Association for assembling many of these wines and thanks, also, to Mike Bampfield Duggan of Wine Concepts for generously sharing his Chenin Blanc discoveries. Time did not permit more extensive tasting, so important wineries that previous tastings have shown to produce outstanding Chenin are not included in this article. We promise to give them priority in followup tastings later in the year. Bellingham 2010 Bernard Chenin Blanc 94 Green gold. This 2010 vintage bottling shows how beautifully Chenin can age. Made from old vines up to 55 years of age and aged a minimum of 9 months in barrel, it reveals vibrant mango and beeswax on the nose and offers multiple layers of generous flavors on a succulent, tropical palate. Excellent freshness underpinned by remarkable juicy acidity. Deetlefs 2017 Reserve Chenin Blanc 92 Flint, honeysuckle, and peach scents give way to densely flavored palate with a firm backbone and fresh acidity. It all comes together in this opulent and expressive wine. Made from vines planted in 1987 and 1993 and fermented in barrel (22% in new 500L) and a small amount fermented in concrete egg. 4% Viognier blended in, half skin fermented and half oxidized. Ferdi Visser makes the wine. Delheim 2017 Wild Ferment Chenin Blanc Stellenbosch 91 A superb example of a Chenin Blanc partly matured (30%) in used French oak, giving the wine a pleasing fatness without noticeable oak flavors. Finely delineated, dense guava, peach, and cured lemon on a broad, full palate with vibrant freshness. Klein Zalze 2018 Vineyard Selection Chenin Blanc Vineyard Selection 89 Pleasant bouquet of quince and melon that’s mirrored on an easy drinking, nicely delineated palate. Finished clean and fruity. Fermented and aged in neutral oak for 6 months. Klein Zalze 2017 Family Reserve Chenin Blanc Stellenbosch 91 A harmonious wine, beautifully integrated with a nice chewy depth of flavor and a subtle touch of sweetness. Impressive persistence of minerals and fruit. Old (40+ years) dry farmed bush vine fruit fermented and matured in 400L French oak for 8 months. Luddite 2017 Saboteur Overburg 90 An unusual 77% Chenin Blanc blend with Viognier and Sauvignon Blanc partners aged in barrel for 6 months. Appealing nectarine and almond nose. Firmly textured with full flavors and an appealing mineral like character. Good extract on the finish. Michaella 2017 Chenin Blanc Stellenbosch/Paarl 92 Beautiful texture and balance. Vibrant fresh yellow stone fruit, wet gravel, and a perfumed gardenia scent appear on the bouquet and are mirrored on a sensuous, silky full flavored palate with good balancing acidity and perfectly integrated lightly toasted oak. Fruit from trellised bush vines planted in 1971. Fermentation begun in stainless steel and finished in large format oak barrels where it is further aged on the lees. Opstal 2017 Carl Everson Single Vineyard Chenin Blanc Slanghoek 93 Highly complex, perfumed bouquet of yellow flowers, acacia, peach and beeswax. Soft on entry and creamy smooth palate with well integrated stone fruit, marzipan, and honeycomb. Acidity gracefully supersedes sweet fruit on a prolonged finish. From a 1982 single vineyard that’s part of the Old Vine Project; spontaneously fermented in barrel over a 4 month period and aged another 6 months in large format French oak barrels. Attie Louw is the winemaker. Spioenkop 2017 Johanna Brandt Chenin Blanc Elgin 91 Fermented and aged one year in oak, the Spioenkop Chenin Blanc retains a crisp, fresh personality. Full ripe flavors of stone fruit are complemented by bright acidity. Stofberg Estate 2017 Chenin Blanc Breedekloof 89 A very appealing wine with emphatic lemon zest and flint like notes on the nose. The palate is full and round and densely flavored with just enough balancing acidity to keep the wine bright and lively. Finishes with good persistence. Just the right amount of oaking, too. Sourced from 30 year old vines grown on sandy loam alluvial soils and fermented in lined concrete tanks. After 2 months lees contact, wines from free-run and pressed juice are blended and aged 4 months in 225L French barriques for 4 months. Pieter Stofberg is the winemaker. Stofberg Family Vineyards 2017 Mariëtte Chenin Blanc Breedekloof 91 Honeysuckle and toasted hazelnut scents give way to a bright attack of lemon curd and fresh apricot. Richly oaked but well integrated on the palate and densely flavored with scintillating citrus acidity and a long, lingering finish. Very well done. From 34 year old vines grown on rocky sandstone soils, hand picked, 40% whole bunch pressed and fermented in 225L barrels, 20% new. 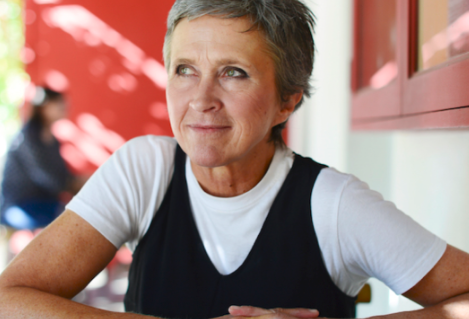 Mariëtte Stofberg Coetzee is the winemaker. This entry was posted in Countries and Regions, South Africa, Uncategorized, White Wine, Wine Type and tagged Chenin Blanc, Old Vine, WOSA. Bookmark the permalink.